This simple and easy pattern is a great way we can all show our loved ones how much we appreciate them. With Valentine’s day fast approaching, you have probably noticed the many crochet love heart patterns online. So instead of posting the same design, I thought I would add a little twist to my Valentine’s Affirmation Love Heart gift ideas. For this pattern, I have used Caron Simply Soft Party Yarn which is a 10ply yarn and will give your little hearts a subtle sheen adding a dash of sparkles. The other yarn I have used is the beautiful Lily Sugar n Cream which is very durable cotton with the most amazing colour range to choose from. I suggest pinning an inspiring positive affirmation onto the completed crochet love hearts and placing them all into a mason jar or small glass bowl. So, when your loved one is feeling low all they need to do is pull out one of the love hearts, read the affirmation you wrote especially for them, and I’m sure you will put a smile on their face every time they choose a heart. Below you will find our FREE pattern along with step by step instructions on how to make these very easy little love hearts. Caron Simply Soft Party Yarn in Red or mix it up and use a variety of colours to make your hearts pop. Or try using the beautiful Lily Sugar n Cream yarn available in so many amazing bright, pastel, stripes and Ombre shades. Quick and easy love hearts that you can make in just a few minutes. Note: One heart is worked in a single round. To complete a magic circle, please see our tutorial video from our YouTube channel on how to create a magic circle. Chain 3, then TC x 4 in a circle, DC x 4 in a circle, CH 1 TC x 2 in a circle, CH 1, DC x 4 into circle, TC x 4 into circle, Ch x 2 then slip knot into the center of the circle. Pull tight to close the circle. You can choose how big your circle will be in the centre by pulling tighter or by making it lose. 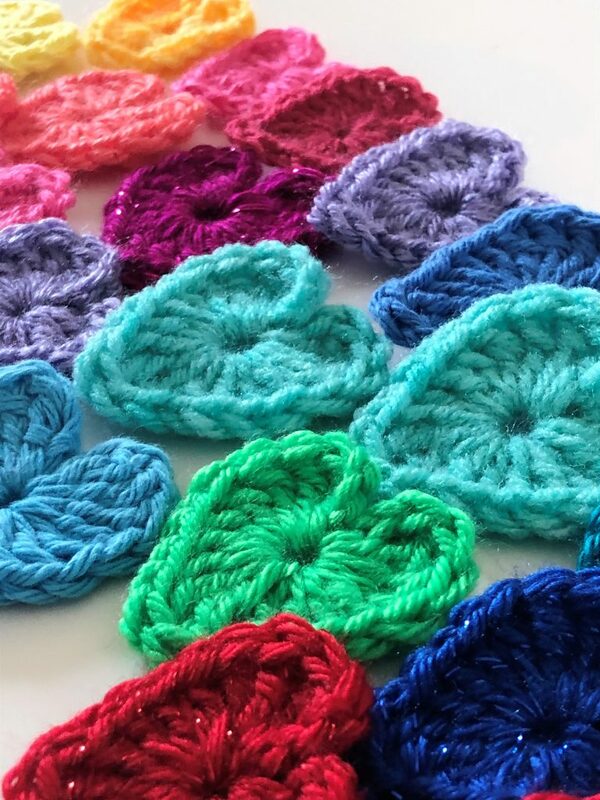 For a video tutorial on how to crochet these love hearts please follow the link over to our YouTube channel or please find below a step by step picture tutorial. To make the affirmation scrolls, simply write down your personalised words or messages onto a piece of paper, then roll your affirmations up into a scroll, put a ribbon around the scroll and insert into the centre of the crocheted love hearts. Place a handful of your personalised Affirmation Love Hearts into a glass bowl, jar or whatever you have at home, and gift it to the one you love.